You are currently browsing the category archive for the ‘genetics’ category. I’ve been an atheist since age fourteen. Actually, if I’m being completely honest, I’ve been an atheist since I started pondering religion (probably right around the time my mother told me to put away my coloring book and start paying attention), but I was fourteen when I first heard the word. Prior to that, I would go to church with my parents, and sit there thinking things like I’m not sure about this, does no one else realize that a lot of this doesn’t make logical sense and I can’t wait until I’m a grown up and I don’t have to go to church anymore. When I first heard the word atheist, it was possibly the only moment of clarity I’ve ever experienced. It was a so that’s what’s up with me—there’s a name for it, moment. It was really great to have a handy label, but at no point did I ever want to seek out other atheists for existential chats, or find people like me, or organize in any way. The way I see it is, religion is an organization of people who believe the same thing getting together to discuss and learn about their beliefs. Since I do not believe in a god of any kind and am perfectly content with that, why would I need to get together and talk about it? How do you talk about a non-belief? I’m fine with groups like the American Atheists just as much as I am with any religious group until people start proselytizing at me, but religion is no part of my life the same way non-religion is. It seems like organizing in this way is just the same except the conversation is different. Recently The Pew Research Center did a study on religion & public life, which has been getting quite a bit of press for turning up some interesting facts namely that atheists and agnostics did better on a basic religion test than most Christians. That makes perfect sense to me because learning about what people believe and why from a purely clinical researchy standpoint is fascinating. I’m intrigued by religion and ritual because it’s intriguing, not because I buy into it in any way. Though if I was spending an hour a week doing an activity, I would probably try to learn a few of the basic facts. This study then led to a group of atheists, agnostics and humanists to get together and discuss the future of their movement, which went badly because they couldn’t agree on anything (it’s a bit tricky when your movement is based on non-belief rather than a set of rules and ideas). Of course, I don’t want the Religious Right to somehow get prayer into public schools, but I also don’t want to go to meetings and pay dues to yet another organization where we sit around talking for hours and accomplish (probably) very little. Since Religion is a man-made idea, why can I not seem to opt out? Why does everyone have to be something? I mean, yes, I’m an atheist, but I’m not an emphatic atheist, it’s just that I don’t believe in god and it’s a handy word to bandy about because people know what it means. I could just as easily call myself a non-theist (which is closer to my non-beliefs, I guess) or a secular humanist, or an evolution fan–who cares? Why talk about something you don’t believe in? Do you really have that much to say about it? Often when I tell people I’m an atheist, they say something like, “what were you, what are your parents?” Then I say Lutheran, and whoever I’m talking to seems to unclench. A friend who slipped more and more into crazy strident religious territory over the course of our friendship once told me that since I had once, when I was like six, parroted back the words “I accept Jesus Christ as my lord and savior” I was ok— not going to hell. My protestations that I didn’t actually believe what I had said, and that I have since rescinded that statement, didn’t seem to register with her. I’d said it once, was not going to hell, let’s have some onion rings. I won’t be signing up with any organized atheist group anytime soon, and perhaps this is just a further manifestation of my non-joiner personality, but I don’t think so. 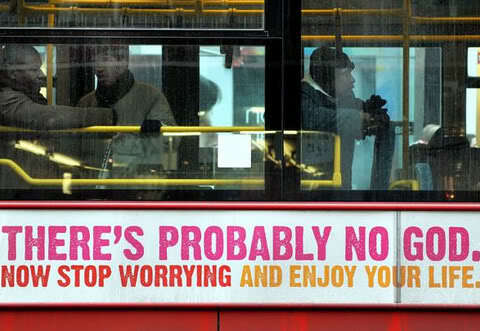 I do like those bus ads though. …just wish it didn’t say probably. 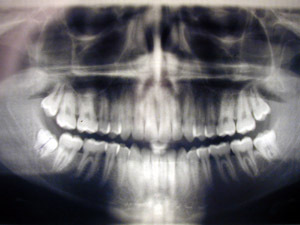 About ten years ago, I had my wisdom teeth removed. As I was in the salad days of still being on my parent’s heath insurance, I got to go to an oral surgeon, get general anesthesia and painkillers afterward rather than trolling the internet for the cheapest medical care I can find or just crossing my fingers and hoping whatever it is goes away, like I do now. Early in the morning I went to the oral surgeon, and the doctor (who has the largest hands I’ve ever seen on a human) cut out my three wisdom teeth while I slumbered peacefully. After that, as I was coming out of anesthesia, an incredibly annoying women wearing garish scrubs tried to keep me awake by telling me that Days of Our Lives was on. My memories of this experience are naturally hazy, but I remember being unable to speak thinking, why the hell would I want to watch Days? I hate that show. If I just quietly close my eyes and go back to sleep, she’ll never know… Finally she got so fed up with me, she forced me to get out of the bed and sit on a bench. Then the doctor came in and told me that the EKG from when I was put under indicated that I have an irregular heartbeat. Despite the fact that I was nearly unconscious, couldn’t speak and was still under heavy sedation, he asked me a number of pointed medical questions and advised I get myself a specialist. When I woke up two days later, Map Fleece reminded me of this new and exciting medical condition to explore, and I set out in search of a cardiologist. After echocardiograms, and discussions that included questions like “Do you get short of breath climbing stairs quicker than other people do?” and my response, “How in the world would I know how quickly other people get short of breath climbing stairs?” and laying out my entire travel history (this heart condition may be Mexico’s fault) it was concluded that, yes, I do have an irregular heartbeat. Always comforting words to hear. Since that time, I’ve been kicked off my parents’ insurance and have not spent much time with doctors. There was the stress fracture in my foot incident, which cost way too much money to have diagnosed and which completely soured me on medical treatment of any kind. Thankfully, aside from a broken toe, and torn calf muscle, the last few years have been pretty uneventful. Until the other morning when I was stumbling bleary-eyed through the bathroom on my way to make coffee and noticed that my face was twice its usual size. My entire jawline was swollen in a way that made me look like a cartoon character. I also had a splitting headache, earache and general sense of unease–though that may have been a symptom of the impending doom of paying for medical treatment again. I immediately asked the internet what was wrong and learned that I’m probably fighting off an infection of some kind, or it could be cancer–have to wait and see. As my ears hurt, I assumed that I just have a simple ear infection that a bit of amoxicillin can wipe out handily, but as my face has never grown to twice its normal size before, I was still a bit alarmed. Gentleman Scholar kept giving me worried looks as I sat on the couch all day feeling sorry for myself and watching The Office, and finally after three days of large face I went to the University Health Center at my job (where I can go for free and get a $13 throat culture!). By the time I actually made it to the health center, my face was back to its normal size, and the Nurse I spoke to was very disappointed in me. “So it was swollen, here?” she asked. “My ears hurt a bit, and I had a headache, but that’s gone now.” I was starting to feel like I should have taken pictures to prove that I wasn’t making this whole thing up. “If it happens again, you should come in while you’re still symptomatic.” She said, in a way that sounded like she was chastising me, even though the health center had been closed for the holiday weekend. They are not making a convincing case for spending tons of money insuring myself. My grandfather went to the doctor about three times in his life. He was a farmer who presumably got injured all the time (farming seems dangerous to me), and finally, when he was 88, his leg turned black for mysterious reasons and my grandmother forced him to go see someone. I have no clue what was actually wrong with him because that wasn’t the important part of the story, as my grandmother told it. The important part to me–he lived til age 95. Is this what they mean by taking care of your parents? My dad used to always make jokes about which of us kids he and mom would come and live with once they get old and infirm. “I can’t wait until you get to take care of me, Annie.” he’d guffaw over and over never thinking it was less funny that the twelve times he’d said it before. I’ve been feeling a bit bad lately because I haven’t spoken to my parents in more than six months. Occasionally, I get the guilt-inducing email from my mother asking if I’m alive, but I haven’t called them and they haven’t called me. I simply refuse to feel terrible for not calling when if they really wanted to hear my voice, they certainly could make that happen. I also suspect that there’s another reason that they’re not calling. They know exactly where I, the underemployed, uninsured public servant with two masters degrees stands on the healthcare debate, and I suspect that actually speaking to me, even if we talk about other things, might make things a bit uncomfortable. I avoid talking politics with them as much as possible because it doesn’t get us anywhere. My mother used to pick fights with me during the Clinton administration, but has since backed off, possibly because on the eve of W’s re-election she was having a crisis of Republicanism, and we actually had an intelligent, respectful debate. Prior to that, our political discussions often went something like this. ANNIE and MOTHER are sitting at the kitchen table. Annie, a junior in high school, is eating a bowl of Lucky Charms and working on the crossword puzzle. Mother is reading the newspaper. The only reason gay people want to get married is so that they can take advantage of health insurance benefits. Of course it is. Why else would they be making such a bit deal out of it? It’s ridiculous. They could just get better jobs and quit pushing for something so unnecessary and wasting everyone’s time. Eventually, she quit picking on me because even as uninformed as I was, logic flew in the face of everything that she held so dear. That comforted me; it made me believe that my parents were still rational beings. Since I don’t know where my parents are most nights, I said no, and pictured some kind of lame church function. “I got a phone call from Mom telling me that they had jus t attended their first Tea Party meeting.” My brother went on to say that recent conversations with them have revolved around how that poor Sarah Palin was treated by the media, and how awesome Glen Beck is, but even knowing this (and keeping it from me), he truly did not believe that it would come to this. 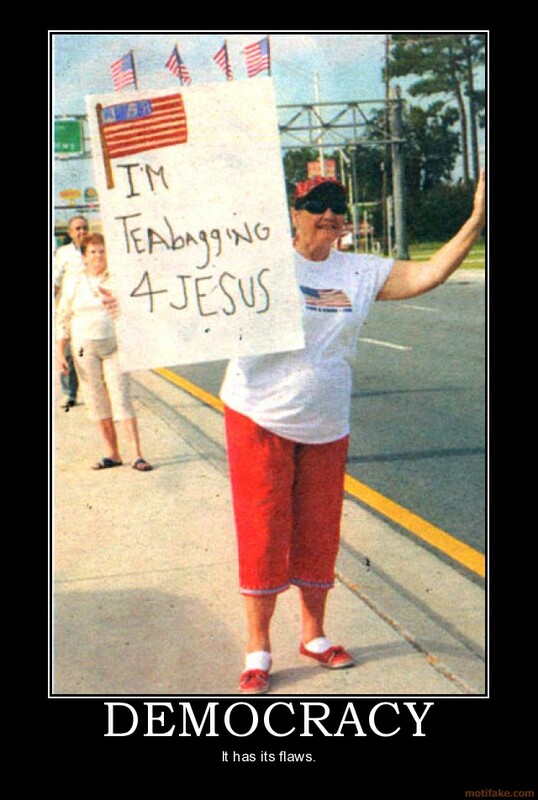 I skimmed an article recently talking about how latest polls show that Tea Baggers are more educated and erudite than the earliest incarnations of the movement (and I do mean bowel), but I seriously did not believe that my parents would buy into this. I wanted to say “white,” but instead told him the truth; half Norwegian, and then a bunch of other stuff. I had no idea what to do with this information. Growing up in New Scandinavia, I know what Norwegians, Swedes, Icelanders look like. Everyone knows what Italians, or Greeks are supposed to look like…but Armenians? I have no preconception for Armenian. Because I’m freakishly pale, people usually assume that I’m either English or Irish (that also depends on the redness of my hair when the question is being posed). People have also asked if I’m German, rather insisted that I must be, given my last name; they’ve asked if I’m French, Russian, basically almost every European (and logical Asian) country except the ones that make up the biggest part of me. I don’t know if my appearance is just really enigmatic, or if people don’t realize that non-blondes come out of Norway and Sweden. What’s interesting, besides the fact that I have no idea what Armenian people look like, is that Gentleman Scholar (rather to my chagrin) has become a bit fascinated with genealogical research lately. At first I recoiled, considering my past and current experiences with genealogical researchers, but he’s not a douche about it, so I’m glad he’s happy. Except he got a bit bored with his own family one day, since they all died poor, tragic deaths in Providence, and decided to snoop a bit into my family tree. It turns out that I have a pretty impressive pedigree, so much so, that someone else actually traced one particular line back to the 1200s, and some of my ancestors were Boston bigwigs before heading west–so much for me getting that EU passport I’ve always wanted. Gentleman Scholar was so excited to tell me this stuff that he actually woke me up by shaking me like someone in a movie. As mildly interesting as this all is, I have to say, I really don’t care. This is hilarious because Gentleman Scholar’s family is a bit dull, and he cares a lot, whereas mine are interesting, and I can’t be bothered. It is kind of cool to know where I come from, but it really doesn’t have anything to do with me right now. So what if I had important ancestors, does that make me important? Not really. I certainly don’t expect anyone else to care what long dead people were up to when they lived in Lincolnshire. That’s the problem with genealogy as an obsession. You find out all this stuff that’s exciting (to you) and you want to talk about it, but no one else really wants to know. It would be cool if I were doing research on a certain period, and came to learn that I was descended from someone who did something cool in that context, but other than that, it’s just names on paper. Having all this new information, I don’t feel like I know anything more about myself. When I was growing up and would tell people that I wanted to be a writer, they’d ask if there were any other writers in the family. I’d mention the famous one, and they’d get that knowing “that’s where you get it from” look in their eye. I don’t like this predestination approach to my life where the only reason I do what I do is because of inherited traits. I’m far too bratty for that. Of course, I probably got that from someone as well. I am an uninsured American. Obviously this is not all I am, and it’s certainly not how I introduce myself at parties, but it’s a fact, and I deal with it as best I can. I got an email from Jewish Friend the other day, subject line Talk to a reporter from the Wall Street Journal? Naturally, I was a bit intrigued. Jewish Friend is rather well-connected with the group Young Invincibles, despite the fact that she has health insurance through her job, and as I understand it, once she told this reporter about her uninsured friend (me) with the heart condition and running injuries, the reporter was falling all over herself to get my story. So I gave her a call. In the past, whenever I’ve been interviewed by anyone, I come off sounding like a total moron. Despite my five years in television, I have not mastered the art of the soundbite. When I was in high school I was interviewed by a reporter from the Winnipeg Free Press while at a Rolling Stones concert–because I was one of about ten people in attendance who was younger than 45. The reporter asked me why I liked the Stones, and why I thought they had remained so popular all these years. I did not have an answer for her, instead stammering out something about consistency and showmanship. Honestly, at that point, I didn’t even really know if I liked the Stones or not, I was a girl living in rural North Dakota for whom going to concerts was the only real thing I had to look forward to. I went to the concert to see if I did like them. Had she interviewed me at the end of the show, I would have had a lot more to say. Had I been savvier, I would have just made something up. Similarly, the Wall Street Journal reporter really expected me, the overeducated, underinsured gal that I am to have a lot to say on the topic, and turns out, I really don’t. I’d like insurance, I think that would be handy to have, but I can’t afford it, nor do I have an employer who will provide it for me. Rather than sit at home agonizing about what would happen if I got hit by a car, I prefer not to think about it. I’m keeping myself healthy, mentally and physically, by not dwelling, and that doesn’t make much of a story. She inquired about my heart condition, and I told her that though I’ve been diagnosed, it’s never caused me any discomfort or worry–dead end. She asked about my running injury, and I told her that I diagnosed myself on the internet and followed those prescribed treatments, then I happened to meet a physical therapist while on minibreak in the Virgin Island. “You happened to meet a physical therapist while on minibreak?” she asked me skeptically. Naturally, it was only after I got off the phone with her that I thought I should possibly explain how I can afford to go to the Virgin Islands when I kept insisting I can’t afford insurance, but it was too late. I told her about my recent dental saga mentioning the total cost, and then told her that I had had to cash in a life insurance policy to pay for it all. Never once did it occur to me to explain why I have more than one life insurance policy and no health insurance. Basically, the problem is that I downplay things and am optimistic almost to the point of retardation. Instead of outrage at my job situation, I’m just glad I have a job in my field. Instead of outrage at my insurance situation, I’m glad I can pay rent and do not have a debilitating condition that requires regular medical treatment. Instead of poring over every article about health care reform and shaking my fist at Republican foot-draggers, I’m just waiting for it to work itself out, because it has to. It’s not much of a story. Recently, my boss approached me with the offer to get a health screening at work. “Is it free?” I immediately asked. So I trotted on down to where the health screeners were set up, eager to blow them away with my ablebodiedness. Typically what happens when I get a health screening is that my blood pressure is excellent, I get a bit of a strange look when I get weighed, my resting pulse rate is very low, and then we discuss my exercise routine and lifestyle concluding that I should keep on doing what I’m doing, then I feel great about myself for the rest of the day. It’s a lot of fun for me. This time around, the woman (I assume she’s a nurse, but I don’t know for sure what kind) took my blood pressure. I was alarmed as this has never happened to me before, “I don’t think so,” I told her. During this speech, I tried to interject that this was not, in fact, a late night snack, but dinner, as I had not gotten home from work until 10pm, but she wouldn’t late me break in to what sounded very much like a prepared anecdote for just such an occasion. I’ve figured out my BMI at home plenty of times, but never had it professionally done, so I decided to go for it. What I forgot was that I am a very, unexpectedly heavy person. I’m not big, no one would ever describe me as fat, or overweight, but when I tell people how much I weigh they either don’t believe me, or they are shocked. I told a friend once that he would be amazed how heavy I am–this is a friend who was an avid weightlifter. A few months later, during some work shenanigans, he picked me up and ran with me down the hall. As he, panting, set me down, he remarked, “Wow, you weren’t kidding.” This was when I was at my skinniest, when my mother was calling my brother telling him to tell me to eat, and co-workers were asking how I stayed so svelte. I didn’t get a chance to tell this woman any of this because she weighed me, took out her chart, and then started lecturing me on the importance of exercise, even when the daylight hours are so short, and not filling up on bacon and soda. She and her partner then loaded me down with brochures about losing weight the healthy way, and “exercise for busy people.” Not once did they ask me if I binge eat bacon, or how much exercise I get on average; they just assumed from my weight that I’m sedentary and have bad habits. What surprised me was how bothered I am by this. Having grown up with a mother who is constantly dieting and who loves to make comments about my weight–usually based on how she feels about her weight–I’ve developed a healthy body image almost out of spite. I know none of their assumptions about me are true, but the fact that they would make these assumptions started filling my head with all kinds of notions–what if I am fat, and I didn’t know it? What if my friends and loved ones are just too polite to tell me that I’ve let myself go? My stork-legged, bacon-loving, and staunchly sedentary Jewish Friend quickly reassured me that that was not the case, and I believe her. I like to think that I have the kind of friends who would honestly tell me if I’ve somehow gotten fat without my knowledge. 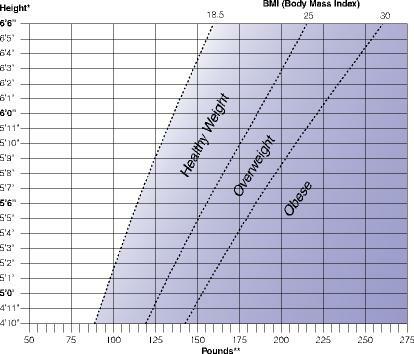 I’ve long thought that the BMI is a load of bunk, because weight is not the final arbiter of health. A friend of mine who recently lost 85 pounds, and is featured in this month’s Fitness magazine, is still technically overweight, according to the BMI. I could start smoking again, quit eating, and be at a “healthy” weight in no time, but that shouldn’t be the kind of lifestyle a workplace wellness person promotes. I want to call this woman and yell at her, but I honestly don’t know what to say. “I’m a naturally heavy person” sounds like an excuse, and calling her up insisting that I run 25 miles a week, haven’t eaten bacon since I was 12, and almost never drink soda would be a very strange thing to do. All I can do is shake it off, though I feel like maybe I’ll picture this woman as I run my next 1/2 marathon. I bet I’ll destroy my old time that way. When relatives would look at my little brother, and remark, “Wow, he is going to be tall.” This happened at every extended family get together, and I would listen to it seething with rage and think, I’ll show them, I’m going to be tall too! Jokes on me, though I do feel taller than I used to, I’m still average height. When people would ask me if I played sports like my brother. My extended family lived far enough away that we only saw some of them once a year. Since my brother was tall (or would soon be tall), it was assumed that he either did play or would play basketball, so they talked about that, then the conversation would extend to college or professional sports, and they would talk as equals. I don’t know if my family was just sports obsessed, or really bad at talking to kids, but they would always ask me if I played sports. If I did, we would talk awkwardly about it because there really wasn’t much to say, and even in my more athletic days, I wasn’t very athletic, and I didn’t really care about sports; or if I didn’t, I get some kind of mini-lecture about not joining enough things, and then we’d talk about my brother’s sporty endeavors. As a kid, I was involved with plenty of other things: I was a figure skater, I was a Girl Scout, I took piano lessons and later played flute until junior year (first chair); in high school I was Future business Leaders of America Vice-President, I was yearbook co-editor–there was plenty of “joiny” things for us to talk about, plus I was always an avid reader/movie watcher/story writer. All this was rendered useless because I hate and am no good at basketball. I imagine that once of my brother’s major grievances is having to talk about sports all the time as well, cause it’s really bizarre, but I’m finding that it’s still continuing. When Gentleman Scholar and I moved into our current apartment, the first floor apartment was empty, and Elderly Neighbor lived on the third floor. He had since moved to the first floor, and Hip Young Couple are in the process of remodeling the third floor getting ready for their move in. Elderly Neighbor being on the first floor, means that his living room is right above my “home gym” i.e. treadmill and tv in the dusty basement. I told him that I was presently training for a 1/2 marathon, and he practically slapped his knee with glee, “I knew it! I knew when I heard you down there, I told myself ‘that girl is training for something’.” Then he bombarded me with questions about my daily mileage, how many races run, how I started doing this, etc. These are all questions I have no problem answering, but it seems to be all he cares about anymore. I’m half expecting him to come scampering down the stairs next time I’m running and monitor my breathing technique. When I used to run into Elderly Neighbor on the stairs, we would talk about librarianship, or my cat, or just random other stuff–now it’s all running all the time. What am I training for? Is usually the big one, and when I say “nothing right now” the look of disappointment on his face is alarming. I mean, I guess I’m always training for something, but nothing I’ve registered for, and that doesn’t seem to be exciting enough for him. It seems like he would be unimpressed if I told him that I just like running. I guess talking about books, movies, travel, librarianship, or anything else that I’m interested in/good at just isn’t going to happen, and I should accept that, and I should avoid him as much as I can. When I lived in the Midwest, all I could think about was leaving it and the great wide world that was my oyster. I barely paid attention to the intricacies of what was going on around me, because I just took it all for granted. When I had been on the East coast for about two weeks, I went to a concert with my brand-new Jewish Friend, and we got to discussing where we come from. “What did your grandfather do?” she asked. “He was a farmer.” I told her. Then we sat there for a bit, marveling at how completely different our lives were. “What’s a Cantor?” I asked. “What did he farm?” she asked. And therein lives the problem. I actually had no idea what my grandfather, the farmer, farmed. We never talked about that, we didn’t spend a huge amount of time with that side of the family, and I just never asked. I always assumed that my other grandfather was a farmer as well, because he lived on a farm, had a lot of tractors and a huge garden. Now I’m starting to suspect he was just a hobbyist. The reason that I keep thinking about all of these things, is because I am friends with a lot of people who are interested in local food. I’ve been to see King Corn, I’m reading Animal, Vegetable, Miracle, Jewish Friend won’t shut up about The Omnivore’s Dilemma etc. Then I’m called upon to tell people how it really is, or at least is where I’m from–and I got nothing. I can certainly speculate, but when people start asking pointed and informed questions, I crumple like origami. I was talking to a friend the other day about this and she asked what we grew in Cavalier, ND. “Sugar beets, mostly.” I told her. “How do you get sugar out of a beet?” she asked. Naturally, I had no idea, even though I grew up eating beet sugar exclusively, so I changed the subject and told her about how we sandbagged the American Crystal Sugar plant during the 1997 flood. I could have turned the conversation around and asked her a lot of questions about orange juice (she’s from Florida), but she probably would have known the answers. My parents were not farmers, so even though farming was a part of our daily lives by proxy, we never really thought about it. My father helped out occasionally with sugar beet harvest, because the entire town did, but that’s about it. I grew up sitting on my grandfather’s tractors, not really understanding how they worked–and I still don’t know if he actually used them, though I suspect he scaled back his operation just before I was born. One person who does actually know firsthand about this is my dear friend Mtanga. She grew up on a family farm that her brother is now prepared to take over now that he’s done with his PhD–because running a large-scale family farm isn’t just something you inherit, you have to learn something first. She and I had a brief conversation about urban farmers, and how we are glad that they do what they do, but also annoyed at people coming down on large farms without knowing anything about it. She said it better than I could, but the point is, I feel like if you want to be a farmer, you should learn the history of your business, learn how others do it, so you can take the good of what they do, try to leave the bad, and ultimately be successful. The mob mentality of assumption doesn’t do anyone any good, and the attitude that large-scale farms are all evil and destroying the land is just ignorant. After all, if you assume that the people that grow your food are intelligent human beings (which I would hope you would) why would they destroy their own means of production? There are over 285,000,000 people living in the United States. Of that population, less than 1% claim farming as an occupation (and about 2% actually live on farms). There are only about 960,000 persons claiming farming as their principal occupation and a similar number of farmers claiming some other principal occupation. The number of farms in the U.S. stands at about two million. For the purposes of the U.S. Census, a farm is any establishment which produced and sold, or normally would have produced and sold, $1,000 or more of agricultural products during the year. (Government subsidies are included in sales.) By that definition, there are just over 2.1 million farms in the United States. It has been estimated that living expenses for the average farm family exceed $47,000 per year. Clearly, many farms that meet the U.S. Census’ definition would not produce sufficient income to meet farm family living expenses. In fact, fewer than 1 in 4 of the farms in this country produce gross revenues in excess of $50,000. According to the 1997 Census of Agriculture, the vast majority of farms in this country (90%) are owned and operated by individuals or families. The next largest category of ownership is partnerships (6%). The “Corporate” farms account for only 3% of U.S. farms and 90% of those are family owned. However, the term “family farm” does not necessarily equate with “small farm”; nor does a “corporate farm” necessarily mean a large-scale operation owned and operated by a multi-national corporation. Many of the country’s largest agricultural enterprises are family owned. Likewise, many farm families have formed modest-sized corporations to take advantage of legal and accounting benefits of that type of business enterprise. It’s easy to look at a large farm and its shiny equipment, and assume it’s something that it’s not, but 90% of those farms are family-owned. People throw around phrases like “death of the family farm,” but that doesn’t really seem to be the case, it’s just that the family farm looks different. One thing I do know about my family history is that my grandfather quit speaking to his grandson for almost a year because that grandson brought a tractor onto the farm, and that was “not how it was done.” It’s not how it was done, but that’s how it is done. People need to eat, and farmers need to earn a living. You can urban farm for the love of it all you want, but understand that a lot of other farmers don’t have that luxury. When I was in Junior High, my overly-chatty and track-obsessed history teacher asked me if I was going out for track. No one had ever suggested that I take on a sport at any other time in my life (in fact, my parents, though supportive, were never upset when I quit all the various sports I played growing up) so I found this shocking and very odd. “I don’t run.” I told him, then went back to my book. A few weeks later, I had to go to the Principal’s office for something, and the school Superintendent cornered me and demanded to know if I was going out for track. I had been going to this school for about four months, had played no sports, and was mostly concerned with reading during class and not getting caught. I was not sporty in the least. “I have weak ankles.” I told him, and left the office. It seemed like making up a medical reason was the only thing that would get these people to leave me alone. I still am not 100% sure why all these grownups wanted me to be in track. The only reason that makes any sense is that they knew my dad is a runner, but it seems weird that they would think I was too. I didn’t actually start running until I was about 25. I was working at tv station and got a discount on a gym membership, walking on the treadmill one day got a little boring, so I ran. I didn’t like using the machines because there was always some bitchy woman staring you down, or some little old lady just sitting at one watching tv–so I just ran every day. My friend and former co-worker/fellow gym-goer, Danie (who is presently training for her first 1/2 marathon), used to surreptitiously follow the personal trainers around as they were doing sessions, and nab free training advice. When she told me this, I was quite impressed and remarked that I should do the same. I used to run to my piano lessons pretending that I was being chased by wolves, so really, she wasn’t far off. While I was participating in my recent medical study, I was required to have a physical. I haven’t really had a lot of physicals in my life because I never played the sports that required me to get one, and I don’t like to go to the doctor. I dislike going to the doctor primarily because I often don’t have insurance, but also because I always feel like I’m wasting his/her time since there’s never really anything major wrong with me. Unless I’m bleeding from the eyes, or have an obviously dislocated body part, I feel like I should be able to just wait out whatever I think is wrong with me. This time I had to get a physical because they wanted to make sure I was fit enough to get drunk. The doctor came into the room, asked a few routine questions, and took my blood pressure. Something inside my head went zing, and I realized I have finally achieved low resting pulse rate–tangible evidence that all of my hard work has paid off. The deal with the low resting pulse is that it’s basically a measure of fitness. The lower the better because if your heart can pump as much blood as you need with fewer pumps, that means that your heart is stronger. Lance Armstrong’s resting pulse is 30, as is Dean Karnazes‘–the man who ran 50 marathons in 50 states in 50 days. Average is 65-75, mine is about 53. Then the doctor took my pulse manually, and because I was so excited about this news it had sped up. Recently, a woman called the library and was asking questions about the postal service exam, specifically what kind of study guide would be best for her. We have three on the shelf, so I examined them to see what the difference was, while she rambled on in my ear about how hard the test is, how expensive it is to buy the study guides, but how if you fail the test, you get your money back. “That’s awfully nice of them.” I commented. Then I started thinking that I should take the postal exam just to see how hard it actually is. I justified this in that I could then tell people who come into the library for postal exam study guides how hard I found it to be, and either assure them, or insist that they need to study. I’ve always been a sucker for assesment. When I was a junior in high school, our study hall supervisor announced that anyone in grades 11 and 12 could sign up to take the ASVAB (Armed Services Vocational Aptitude Battery) I had no intention of joining the military, but it was free, I got out of class, and I was curious if I did ever want to join the military, how good I would be at it. I took it again the following year to see if I could beat my previous score. Since I went to High School in the Midwest, most schools I was applying to did not require the SAT. For some reason, this is a test I’ve always been afraid of, and so I never opted to take it. Instead I took the PSAT, and the ACT (twice). Once I got to college, I stayed undeclared for my first two years (much to the horror of my mother). During that time, I joined an undeclared students group devoted to helping us find ourselves, via Meyers-Briggs and other personality analyzing tests. I would say that in my first semester of college, I took about 20 self-assesments, and always found them fun and insightful (though they always said the same thing). When I finished my first masters and was in the throes of my first major life crisis, my solution was to take the LSAT and the GRE. I eventually scrapped the LSAT, but I actually studied for the GRE, which I had never done for a test like this before. My philosophy up to this point was that I was testing what I already knew. What I knew about the GRE, was that I hadn’t done math since sophomore year of High School, and I was in desperate need of a refresher. As I look at all of the testing study guides on the library shelf, I feel supremely inadequate. There are so many tests I’ve never taken, which means that there are people out there who know things I don’t, which bothers me for some strange reason. I have no interest in taking a more specific test like the GMAT or MCAT, but I just want to know if I took the test for x, how I would do. I won’t take the postal exam because if I passed and couldn’t find a library job, I would feel foolish for not wanting to work for the postal service. If I failed, I would feel foolish; and if I passed and took a job with the postal service, I would never be able to take the necessary pay cut to go back to being a librarian. That is a Pandora’s box best left unopened.